The United States Mint announced that collectible versions of the 2009 American Gold Eagle and 2009 American Silver Eagle will not be offered this year. The announcement comes after months of “temporary suspension” for the popular collector coins. The discontinued products related to the collectible 2009 Silver Eagles include the one ounce proof version of the coin, one ounce uncirculated version of the coin, and the Annual Uncirculated Dollar Coin Set. The proof coins had previously been offered each year since 1986 and had become a collector favorite. The collectible uncirculated coins (with “W” mint mark) and the Annual Uncirculated Dollar Set had been offered since 2006 when the products were introduced by the US Mint. The discontinued products related to the collectible 2009 Gold Eagles include the one ounce, one-half ounce, one-quarter ounce, and one-tenth ounce proof coins, a 4 Coin Proof Set, and the one ounce uncirculated coin. The fractional uncirculated coins were previously announced as discontinued in late 2008. The full range of proof coins has been offered by the United States Mint since 1986. The collectible uncirculated coins (with “W” mint mark) have been offered since 2006. The US Mint also announced that they would be offering fractional weight bullion 2009 American Gold Eagles starting on December 3. This will include one-half ounce, one-quarter ounce, and one-tenth ounce coins. 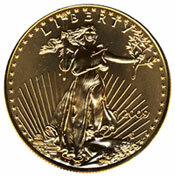 So far this year, the US Mint had only produced Gold Eagle bullion coins in the one ounce size. These bullion coins are not sold directly by the United States Mint, but distributed through their network of authorized bullion purchasers. The US Mint has stated that they are working diligently to increase their supply of bullion blanks so that collectible proof and uncirculated Gold and Silver Eagles can be offered again in 2010.